Eucalyptus oil, Menthol, Thyme oil Snufflebabe is a tropical ointment to relieve nasal congestion (a blocked nose). 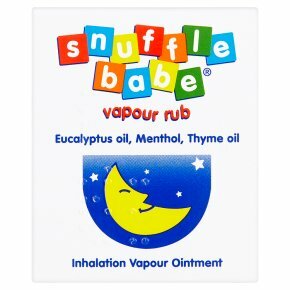 Directions: Infants over 3 months Lightly rub a small amount of Snufflebabe onto upper chest and throat. Alternatively, Snufflebabe may be placed in a tissue or handkerchief in the clothing. To eliminate the possibility of very young children transferring the product into their eye, the handkerchief may be tied to the cot just out of reach. Leave bed clothes loose, so that beneficial vapours emitted may be inhaled during the night. If symptoms persist consult your doctor. Keep this carton as it contains important information about this medicine. Do not use:<br>On infants under 3 months unless advised by a GP, Pharmacist or Health Visitor.<br>On broken skin or apply around the nostrils of infants.<br>If allergic to the ingredients.<br><br>Side effects<br>May include allergic reactions such as skin rash or reddening where the product has been applied. If excessive reddening or any other unusual effects occur, speak to your GP, Pharmacist or Health Visitor. You can also report side effects directly via the Yellow Card Scheme at www.mhra.gov.uk/yellowcard<br><br>Keep out of reach and sight of children.<br>If swallowed seek immediate medical attention.